The 360° Arm Accessory from Kanewell can rotate to any position around the seat, enabling it to be used as an armrest for either the left or right arm, as a forward leaning or elbow support, or as a stretcher bar for the back. It can easily be locked into position when stability is required. The height of the 360° Arm Support is also adjustable so users are able to move it to the elevation that offers them the most suitable support. The 360° Arm Support can be used by anyone who may need to stabilize themselves while leaning. Dentists and Dental Assistants who are often leaning in or forward are able to let the Arm Support bear their weight, reducing strain and muscle fatigue in the lower back. Leaning against a stable fixed support also ensures a greater degree of control, making this accessory a valid consideration for anyone required to stretch outside of their immediate comfort zone while completing tasks requiring fine control or dexterity. The 360° Arm Accessory features a thick layer of polyurethane foam which creates a supportive but cushioned resting surface. The high quality vinyl upholstery is resistant to a wide range of common cleaning solution making it suitable for applications were regular cleaning is required. Note: It is generally recommended that any cleaner be carefully tested in an inconspicuous location prior to full application. Sample testing swatches are available in advance upon request if there is concern regarding a particular cleaning agent. The 360° Arm Accessory comes as a kit which includes both the 360° Arm Support Accessory as well as a replacement pneumatic spring. 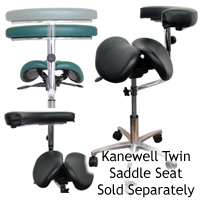 Installation on a new Kanewell Twin Adjustable Saddle Stool is done with ease, as part of the stool assembly. Retrofitting a fully assembled Stool requires removal and replacement of the existing gas lift cylinder with the unit included in the kit, thereby ensuring that the Stool retains is original range of height adjustment.